This half newel cap is particularly decorative and would be particularly well suited to a grand staircase in a large hallway. The classical style of the fluted Grecian can create an impressive focal point for your home. 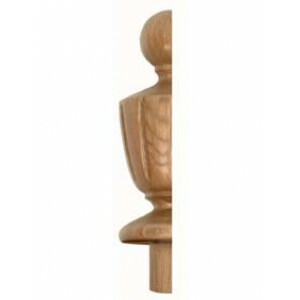 These half newel caps can be produced in a range of different woods. The Fernhill range of stair parts will allow you to stand out from the crowd and make a great first impression for visitors to your home. These parts are perfect for renovating an old staircase as well as building a new one. These stair parts are ideally suited to larger family homes.